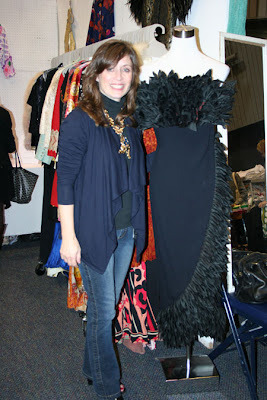 Today we're spending some time with Mary Kincaid of Zuburbia Vintage. Mary devotes herself to the promotion of green vintage by offering her insight as to what's out there in the wide world of vintage. She even crafts a beautiful newsletter that's filled some of the most breathtaking pieces with links to where to find them. Her blog is also a feast for the eyes, and I'll bet you learn a thing or two along the way. I’m working on my second life. My first life was B.C. – Before California. I was a traditional wife and mother who was working in corporate America and living in Ohio. My second life is A.D. – After Divorce. I moved to LA to pursue a long-held dream of working in Hollywood as a screenwriter, producer or talent manager. Now that’s out of my system and I’m a solopreneur focused on speaking, writing, training, consulting and building my brand, Zuburbia. Where/how did your interest in vintage clothing and collectibles begin? As a petite gal, I’ve always had a challenge finding clothes that fit. Sometime in my twenties I discovered that vintage clothes were cut differently than contemporary clothes and were much more flattering on me. I had a limited budget so I started scouring thrift stores and estate sales for pieces. After a while I started finding great pieces that weren’t my size but that were way too gorgeous to leave behind. So I’d buy the pieces and offer them to my friends or my daughter’s friends. Eventually this stack started growing faster than I could find takers so I resold the items on eBay. 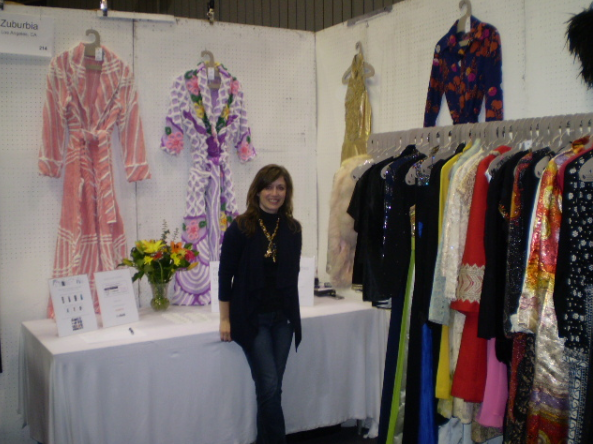 When I arrived in California and didn’t have the space to store inventory and take pictures I became a regular consignment supplier for vintage boutiques in Studio City, downtown LA and Beverly Hills. As for my interest in vintage collectibles, I’ve always had an affinity for decorating and beautiful objects of all types. I just love great design! I prefer not to name specific names but here’s what I look for in my style icons. 1) They’re all ladies who I admire for their authentic style even if I’d never dress the way that they do. 2) They dress themselves and don’t rely on stylists. 3) They may have wardrobe disasters on occasion but over time they exhibit a distinct point-of-view. And finally 4) They choose not to wear fur. What is your personal style like? I would describe my personal style as classic and polished with a bit of an edge. I tend to look pulled together and have a hard time pulling off that bohemian disheveled look that’s popular here in LA. On a typical workday you’ll generally find me in neat jeans, heels (always heels! 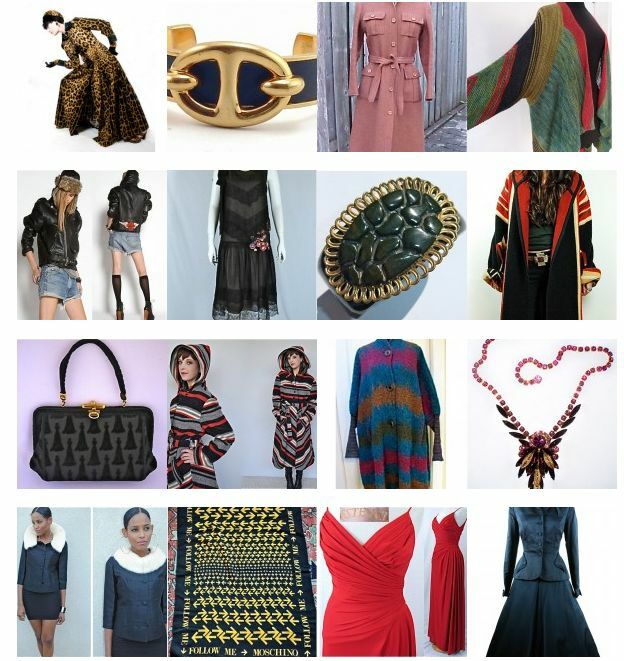 ), a tee, a fab blazer and funky vintage costume jewelry. If you had to pick one item out of your closet that you feel gets the most used and/or was the best investment, what would that be and why? I immediately think of two pieces I acquired this past year. The first is a Paul Smith blazer that is my go-to whenever I don’t want to think about what to wear. It’s just right for so many occasions. Plus it was a next-to-new $14.99 thrift store bargain! 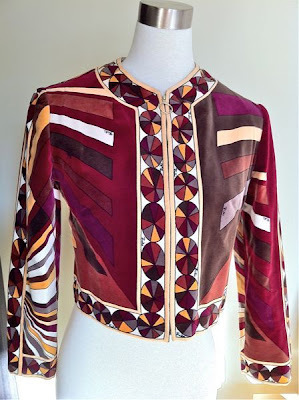 The other piece is a fabulous 1960s velvet Pucci bolero that I grabbed on eBay for around $150 and that’s already achieved a very high CPW (that’s Compliments Per Wear). How do you wear vintage? I try to incorporate one vintage item into my look whenever I go out and that’s often accomplished with great vintage accessories. 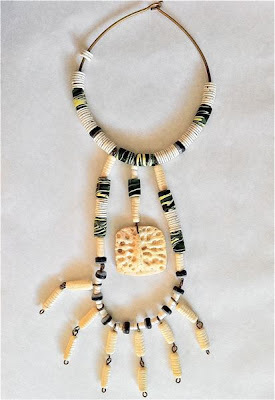 I love taking my classic plaid wool pants suit, for instance, and pairing it with my African bone necklace. Or wearing a plain ol’ pair of black trousers with a wicked pair of 1950s stilettos. I’ve also amassed quite an eclectic collection of vintage handbags I can choose from. Other times my one vintage piece is a smashing coat or blazer or blouse in a really unique and interesting fabric or print. I never EVER wear vintage from head-to-toe. And I always try to acquire truly distinctive pieces. What are your top 5 reasons for buying vintage? That’s easy: 1) Vintage has great quality and details 2) Vintage is the eco-friendly choice 3) Vintage gives you a totally unique way to express your individual authentic style 4) Buying vintage supports small business owners and 5) Vintage is a great financial value. 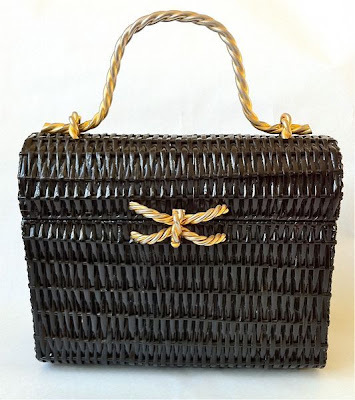 You generally get more bang for your buck and I’ve also had a much higher return on investment on some vintage pieces than I could ever have achieved investing that money in the stock market. 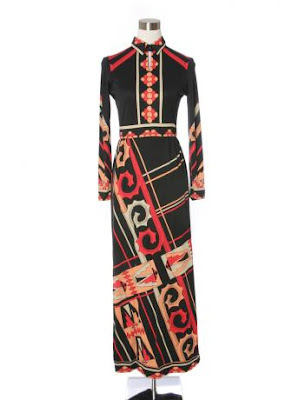 -Do you tend to gravitate towards any specific designers? What are some of your personal 'holy grails'? I don’t really have a wish list because I like to stay open to what the Universe might send my way. But if the Universe is reading this, it might want to send me some space age pieces by Pierre Cardin. Or a fabulous Ossie Clark pants suit. Or maybe a Helen Bond Carruthers sweater. But I could go on and on. And don’t even get me started on jewelry! 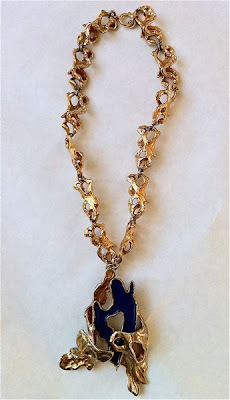 You find so many beautiful pieces online, how do you restrain yourself from buying all these treasures? I’m a big believer in quality, not quantity. Plus I understand that we can never really own anything—we only borrow things for a time. After all, none of us can take any of our possessions with us at the end of our lives. 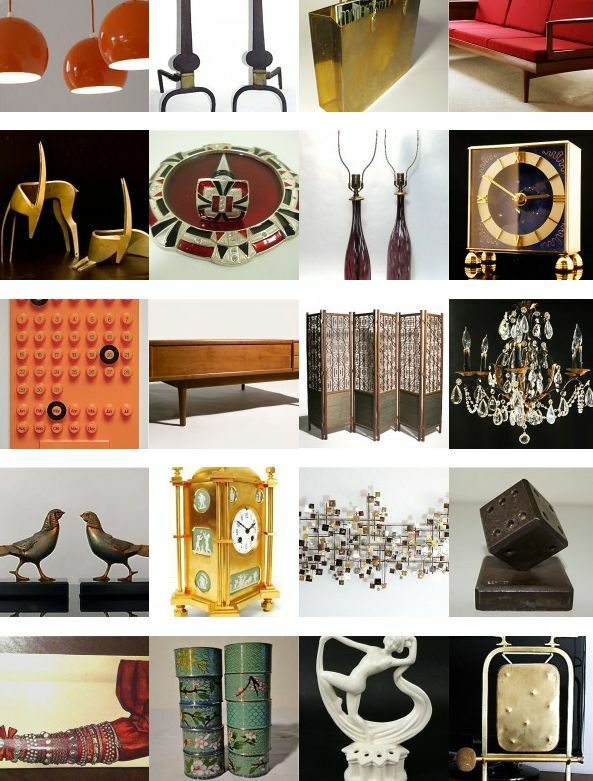 But I believe we can each find great joy and satisfaction in admiring beautiful items even if we never own them. I’ve also learned to invest my money only in things that I truly love, that make my heart sing, and that I’ll enjoy--and not grow tired of--for many years to come. These things don’t come around that often and they’re definitely worth the wait. What are some other sites or blogs that you visit regularly? I have about 75 blogs on a wide range of topics in my reader at Bloglovin. Surprisingly, I probably spend more time reading about politics, science, history, art, business and spirituality than I do reading about current fashion. I add blogs to Bloglovin all the time and then I can just scan the headlines to see what catches my interest that day. I do read the LA Times and the NYT regularly, including their fashion pieces, and I’m a big fan of NPR. I scan headlines at Huffington Post most days and I read Fast Company, Time and The Hollywood Reporter. I also enjoy Apartment Therapy when I have a chance to visit. These days, though, I get a lot of my info about what’s happening and who’s who and what product or website is launching from PR pitches. My definition of success has definitely shifted through the years. It used to be about achieving goals and hitting financial milestones but now it’s more about living life on my terms. It’s become more of a process than a “thing” because as soon as you start to feel successful you realize there’s so much more you can do. I like to compare it to that children’s song about the bear that goes over the mountain and what does he see? Another mountain! So success for me is a moving target. Like many people, I’ve had low points in my life where just getting out of bed felt like a success equivalent to winning a Nobel Prize. But ultimately, for me now, success is determined by how well I’m able to live an authentic life and share my abilities and creativity in a way that inspires and benefits others. It’s about finding peace of mind and discovering and living your purpose on this planet. If you can do that—whatever THAT is for you--then I'd say you’re living successfully. What has been your greatest lesson learned? That life never gives you more than you can handle. And that life’s greatest challenges often hold disguised opportunities. As soon as I open my eyes I grab my notebook and pen and do my Morning Pages as recommended by Julia Cameron. Then I work on my blog. After that I decide on my three big must-do’s for the day, handle email, take next steps on any new projects, check in on website stats and do about 15-20 minutes of social media work. The afternoons are for errands, Pilates class or thrift shopping and a 15-20 minute meditation. Evenings are when I read, watch training webinars, or attend a local class, lecture or event. And I always multi-task by paging through eBay for my Roundup picks when I have TV shows or Netflix movies playing in the background. What is your single most useful tool for business? Definitely my iMac. Switching from the PC platform to the Apple platform was really a life-changing decision. When I left corporate America, I seriously missed having access to a tech support department. But with AppleCare, it’s sort of like having my own tech department on speed dial. Plus the Apple products work like a charm so there are very few hardware or software problems to deal with in the first place. Coming in a close second, I have to mention that I’m a big fan of Evernote software for storing and organizing all the ideas I come across on a daily basis. What has been your most exciting vintage clothing find? When I was still working at the talent management office, I used to stop at one Goodwill store most days before work. One morning, I discovered a navy wool and leather evening gown by Courreges in mint condition! I still have it as part of my personal collection. What do you do for fun? Any hobbies? I was working with a personal coach about a year ago and she asked me this same question. When I answered it, she said, “Most people would call that work!” My down time is spent reading, attending webinars and seminars, or shopping at thrift stores, flea markets, and auctions. I love heading to the Farmer’s Market every weekend and really enjoy cooking (vegetarian, of course!). I also enjoy theater, exhibitions, and movies (which out here in LA often include the added bonus of a Q&A afterward with the filmmaker or actors). And I really want to go walking at Runyon Canyon and the beach more! I’m a voracious reader so I constantly have 20- 30 library books checked out of the LAPL on a wide range of topics. I know that seems like a lot but I’m a super fast reader and have even been a spokesperson for a company that teaches speed reading. So right now titles within my reach include Aleph, The Night Circus, Conversations with Martin Scorsese, Where Good Ideas Come From, The Language of Graphic Design, Vintage Jewelry Design, Brandwashing, Willpower, Beyond Happiness: The Zen Way to True Contentment, and Sleeping with the Enemy, Coco Chanel’s Secret War. I’ve worn the same pair of diamond solitaire earrings every day since my ex-husband gave them to me for Christmas more than a decade ago. They really do go with everything! Thanks so much for spending some time with us Mary. It has been a pleasure learning a little bit more about you! You can find Mary on Google+, Twitter, LinkedIn and Facebook too. She also has a guest column on Huffington Post. Go over and sign up for her wonderful jam packed eye candy newsletter, and while you're over there be sure to check out her Round Up of Vintage Lifestyle Home Finds. It's an Hermes Swimsuit, and it could be yours! Just Who is that Gal?